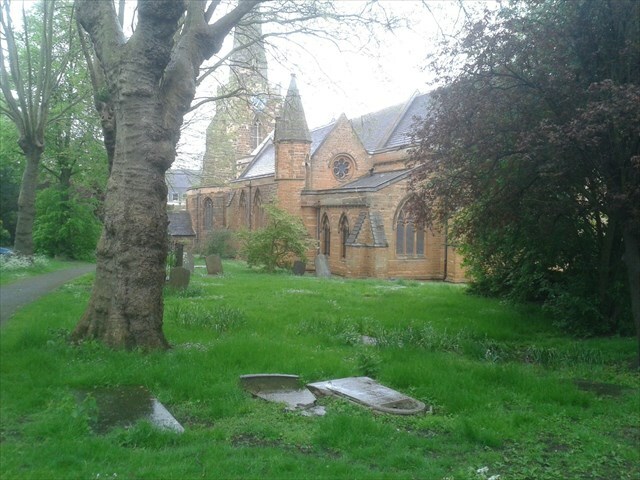 The Holy Sepulchre is a Norman round church in Sheep Street, Northampton. Simon de Senlis, Earl of Northampton, was responsible for making Northampton, England, a Norman stronghold by building a castle (now destroyed) and a town wall (approximately on the site of the inner ring road). It is also probable that he was responsible for the building of All Hallows Church by the market place in the centre of Northampton and the church of the Holy Sepulchre to the north. In around 1096, Simon de Senlis joined the First Crusade to the Holy Land. There he would have seen the Holy Sepulchre, located near the centre of Jerusalem. He would have seen it as a round church supported on eighteen columns or piers with an ambulatory around the perimeter on the west of the church, and the well attested site of Christ's tomb at the centre. There would have been four apses at each of the cardinal points, and on the east side there would have been a facade, so that the east apse was accessible directly from the rotunda. After restoration, this church is what would have remained of a 4th-century church built by Constantine I, with the rotunda replacing an earlier Roman temple. It is likely that after his return to Northampton, Simon de Senlis built the round church of the Holy Sepulchre in Northampton, and it is approximately half the size of the church in Jerusalem. The rotunda is supported on eight round piers with an ambulatory running round the full perimeter, without apses. The remains of a Norman window in the present nave however suggests that the original round church had a chancel to the east. Crusades and pilgrimages continued to the Holy Land, resulting in further building of round churches in England, and around thirty years after the building of the Holy Sepulchre, Northampton, a similar Holy Sepulchre church at Cambridge was built. The church at Cambridge, though smaller than the church at Northampton is interesting to compare, because it may be representative of the original church. You enter the Round Church, Cambridge through a west round-arched doorway. The entrance to the Northampton church may have been similar, as the south porch is of a much later date, and in the 14th century, a tower and spire was added to the west of the round church. On entering the church at Cambridge, you realise the plan is similar with eight large round piers, but unlike the church at Northampton, the ambulatory is vaulted with a gallery above. The piers support Norman round arches and there is Norman dog-tooth or zig-zag decoration throughout. 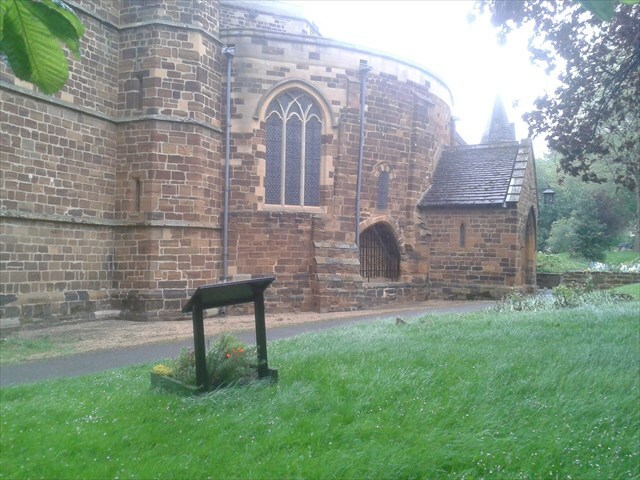 At The Holy Sepulchre, Northampton, three original Norman windows survive: one to the left of the south porch at low level and two on the north at high level. The fact that windows are positioned at two different levels indicates there would have been a gallery. Evidence of a corbel running round the perimeter supports the argument, but unlike Cambridge, there are no springers to suggest the form of vaulting. There are no gallery openings in the rotunda at high level, and the piers support pointed arches characteristic of a more later architecture than the Norman round arches. The church at Cambridge has a conical stone-slated roof. In the nineteenth century it was in disrepair and was restored as was expected to be in keeping with the original Norman design. The Holy Sepulchre, Northampton, presently has a slightly flatter lead roof, and it is likely that the roof was originally as the roof at Cambridge.